For the average person, wireless HDMI transmission is something we want - maybe even need - and yet professional systems can be outragelously expensive. 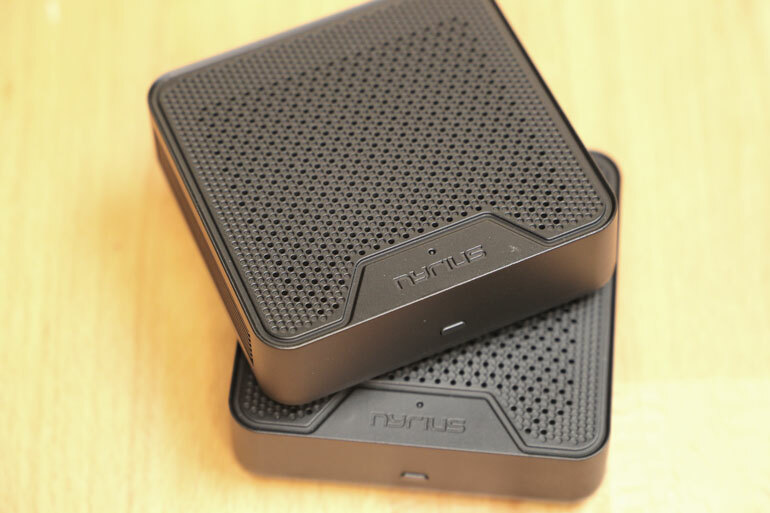 The Nyrius Aries Pro offers a much cheaper alternative for those of us who want wireless video streaming occassionally, but not so much that we feel like dropping 3 month’s rent for. We’ve been using the original Aries Pro for a few years now, and the ﻿﻿updated version for a few months. We’ve also looked at the new Nyrius Orion, which enables you to wirelessly send one signal to multiple monitors or TVs. For the price, Nyrius products are an easy win for most people, whether you’re looking for a wireless entertainment system at home, or a way to monitor a camera feed during a video production, or send a video signal to a projector or TV for a work presentation. For the home consumer, there are lots of wireless streaming options. 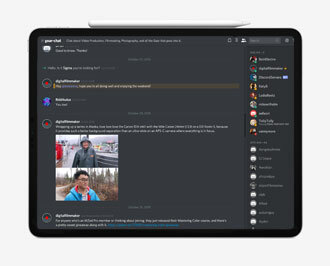 Nyrius provides a good option for many who are looking to stream a movie from a laptop, for example. Or if you have a projector setup out of reach, but want to have your Blu-Ray player at a reasonable height. The Nyrius Aries Prime and Aries Pro have been very affordable solutions for the home consumer. But we’re more interested from the professional creative side, especially as filmmakers. 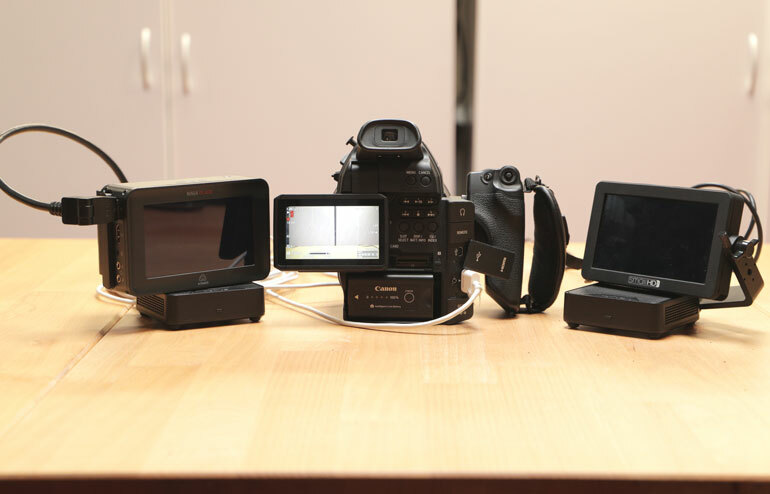 Can you use an Aries Pro as a working wireless HDMI transmitter during a video production? A professional wireless monitoring solution like a Teradek Bolt system can set you back thousands of dollars. 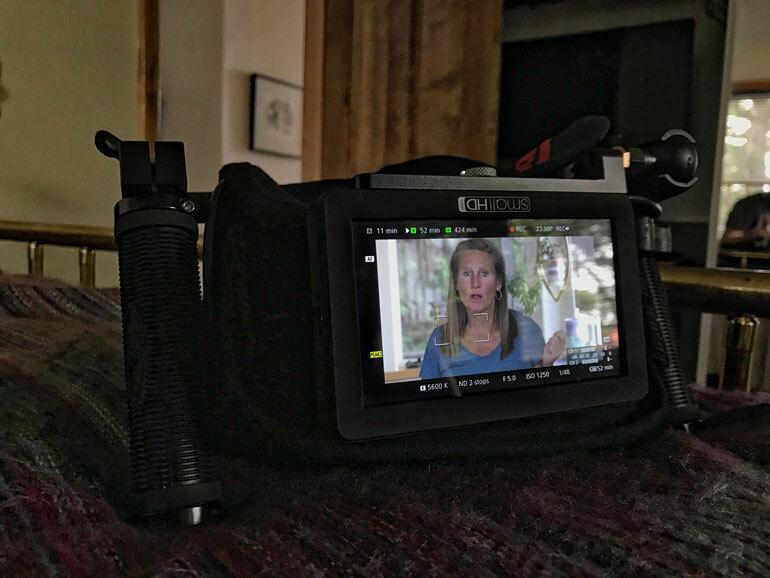 On a large set, high quality commercial, or any paid gig where you’re required to provide a director’s monitor, then yes, a dependable system like Teradek is well worth the cost. 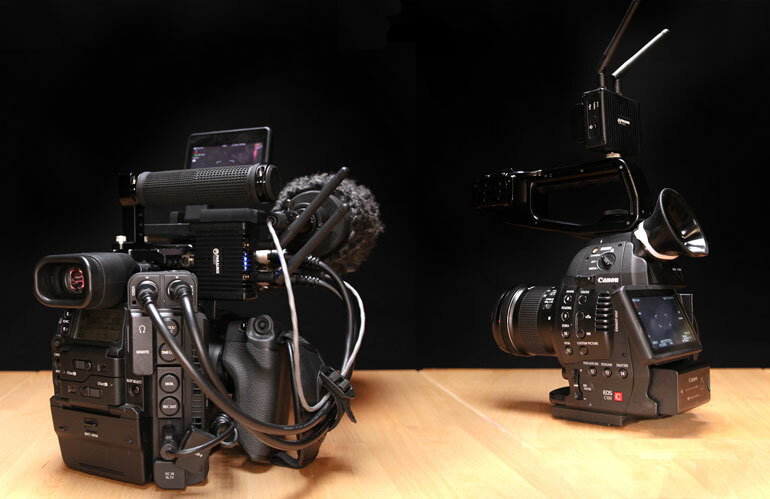 Recently there’s been a few more affordable alternatives for professional camera operators, including the Vaxis Thor system. 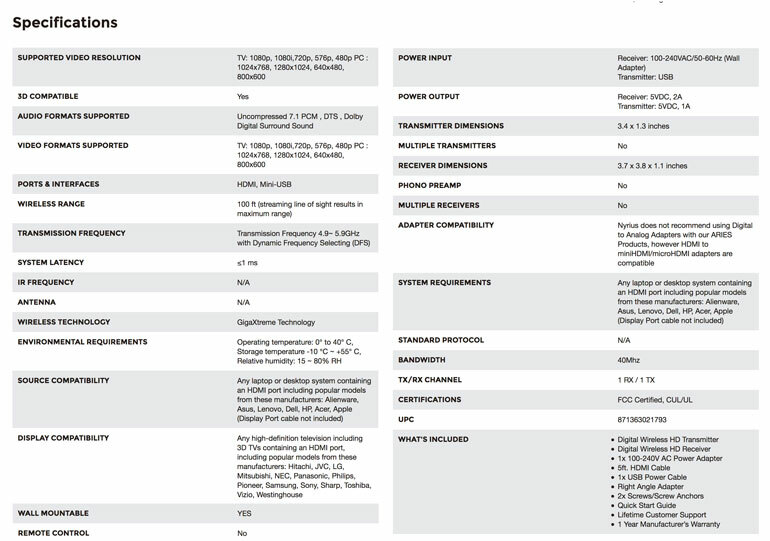 There’s still some debate as to whether Vaxis and other overseas manufacturers are legally allowed to sell their wireless systems in the US or not, due to FCC and patent laws. It’s all a little over our heads, so we won’t get into it. For cameras that have an HDMI-only output, we were highly impressed with the Paralinx Dart when we wrote our review: Wireless HDMI Director’s Monitor for Videographers. 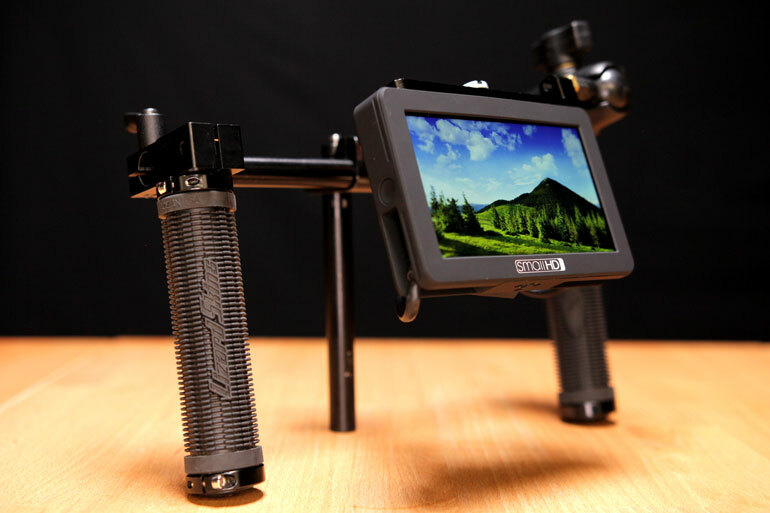 It really is a dependable and durable system for most filmmakers. 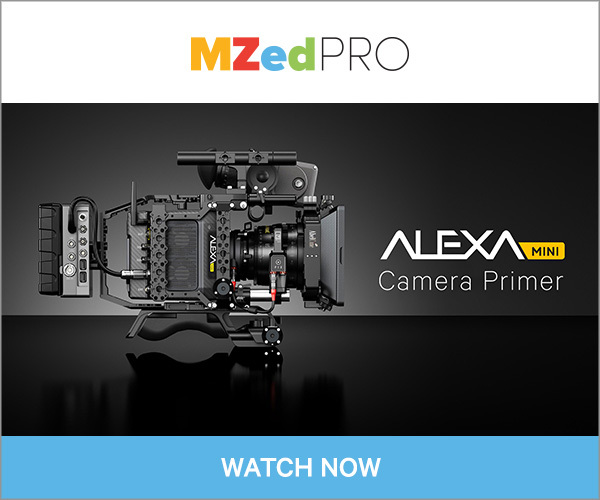 And it’s a little more affordable than Teradek’s higher end kits. Paralinx and Teradek are both owned by Vitec Group, so they share their intelligence and maybe even parts and innovations. Whatever the story is, the Dart is a great little transmitter that can be mounted in a few different ways. The Dart receiver can be placed with a monitor, cables, a V-lock battery, and handles in a little Domke pouch that we like to think we’ve invented (hah). It’s probably easier to just get a Wooden Camera Director’s Monitor Cage. But we’re trying to save money here. The most attractive thing about the Nyries Pro is it’s stinking cheap compared to everything else out there for filmmakers. Everything else about it is a compromise, but for many shooters, they are compromises you can probably live with. 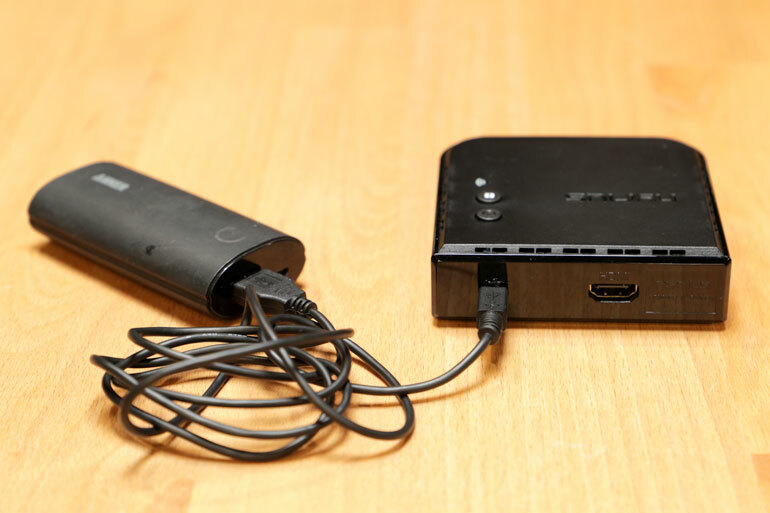 First, the Aries Pro transmitter is just a stick with a male HDMI connector on it. There’s no threads or a battery tray like on the Paralinx Dart. 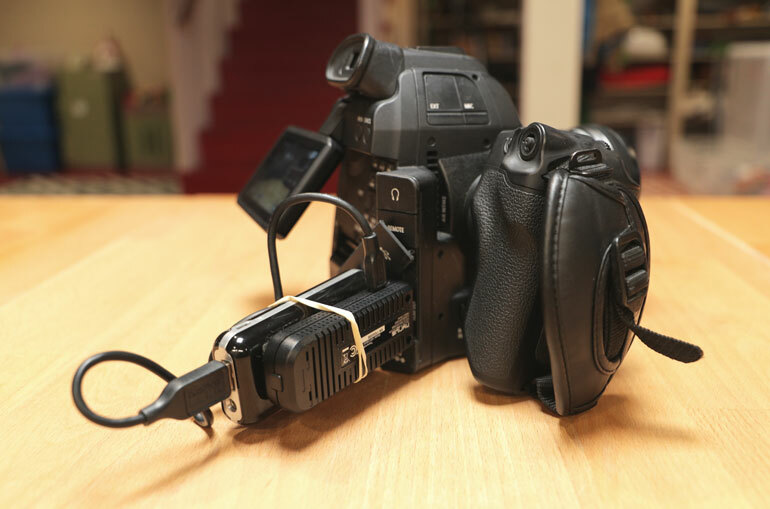 So you’re on your own for figuring out how to power it and rig it to a camera. We’ve used the Aries Pro on a Canon C100 for a few years now, using a couple different approaches. First, we attach a common Anker USB battery to it with a rubber band, velcro, Nite Ize Gear Tie, or whatever else we have on hand. 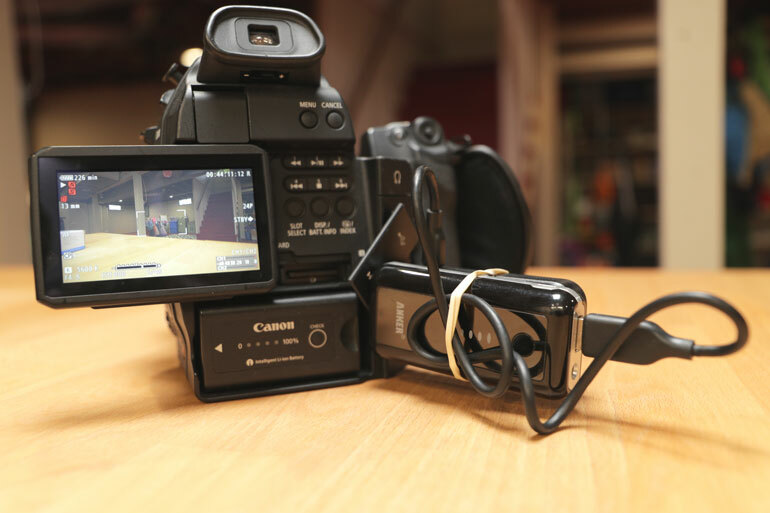 Then connect them with a Micro USB cable, make sure the cable is wrapped and not hanging loosely, and then connect the Aries to the camera’s HDMI out. The disadvantage of this system is that it’s not that pretty, or sturdy. You can easily knock it loose if you’re not careful. Of course, the HDMI port is in a different place on every camera, so it could be perfectly fine sticking out of the left side of a camera, for example, away from where your hand holds the camera grip. But for the record, we’ve used this exact rig dozens of times during a nationwide video production training we created for PBS stations. 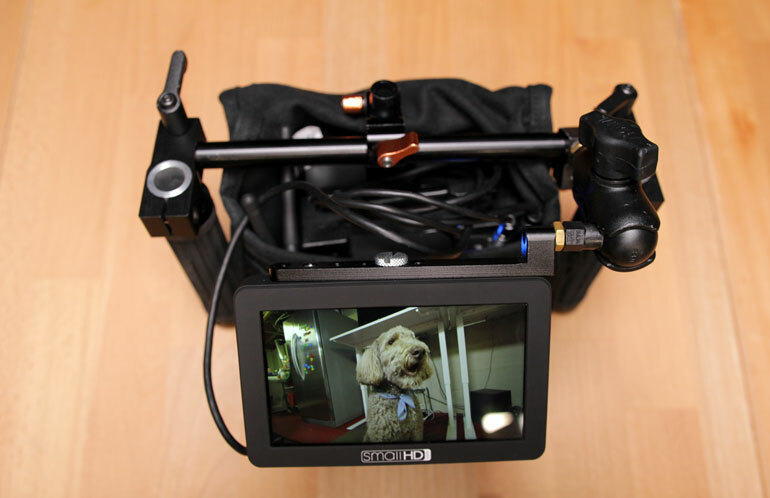 We would attach the Nyrius Aries Pro to the Canon C100 in this precise configuration, then we’d attach the receiver to a big TV or the projector in the conference room, and for 1-2 days this would be how we would teach video production. Part of the reason we stuck to this method is we wanted students to see a Canon C100 in its bare form, rather than rigged up and unapproachable. The Nyrius wireless HDMI transmission system gave us an excellent degree of freedom, without getting into complicated rigging systems that changed the camera in any way. 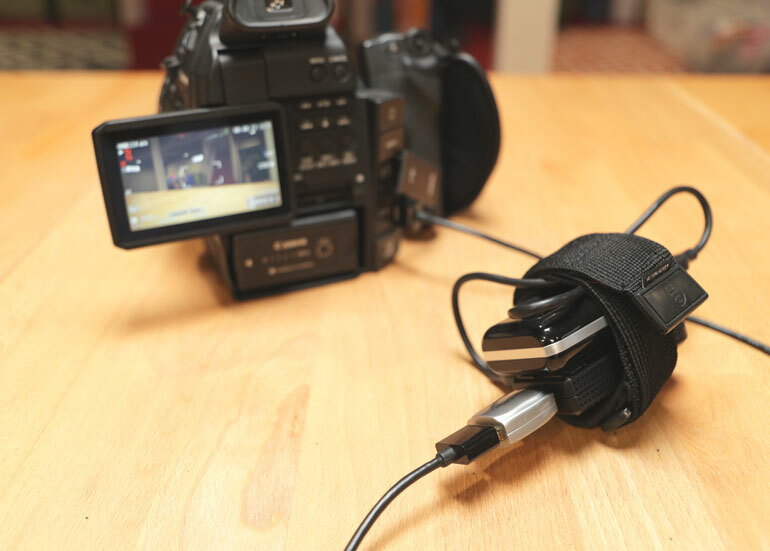 Outside of the training environment, however, we would improve the setup quite a bit by adding an HDMI coupler to the Nyrius HDMI transmitter, and then string a 3-6ft HDMI cable from it, and then attach the Aries Pro and USB battery in a more rigid way somewhere else on the camera, like on top of the handle. We’ve also used this system on a gimbal. 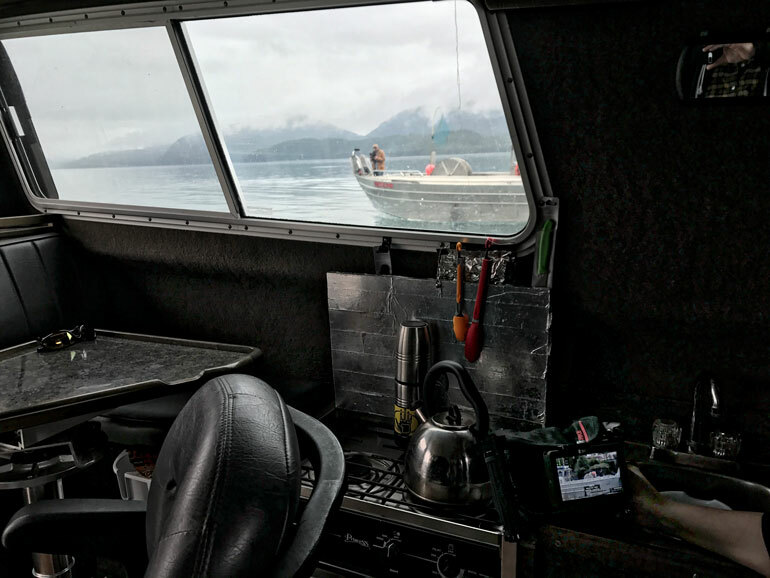 Recently we had the Canon 1DX mkII on a Letus Helix Jr. gimbal for a commercial shoot in Alaska. We had a monitor for the 1DX, and a pass-through HDMI to the Nyrius Aries Pro, which we attached to one of the Helix Jr’s handle brackets. Then we had a portable director’s monitor setup with the receiver. The Nyrius Aries Pro receiver can also be powered by a USB battery. So just like our Paralinx Dart pouch rig, you can throw your Aries receiver, a battery, cables, and everything into a Domke pouch, attach some handles to a rod, and place your monitor outside the pouch for a DIY approach to a director’s monitor. The older Aries receiver could only be powered via a DC out, so you had to find the right DC to USB cable that made it work in a production environment not near a wall outlet. But the new model makes all of that much easier. 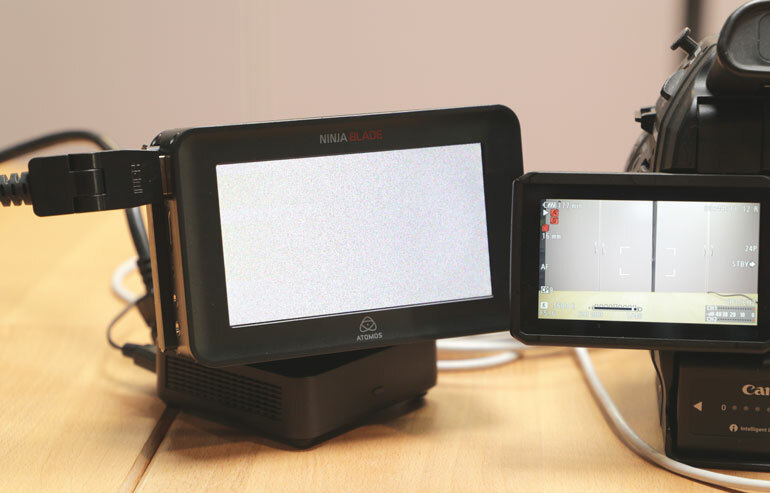 Now that you’re familiar with a little bit of the mounting challenges for using the Nyrius Aries Pro vs a professional wireless monitoring system, what are the other limitations? Well, the most important thing is how easy it is to use, and how dependable the signal is. For ease of use, we’ve never monkeyed with the pairing or internal settings, on either our old Aries or the updated one. The transmitter and receiver comes automatically paired and it just works. We did try and see if the older and newer models pair together, and they don’t. So, you don’t have to worry about messing up the individual pairings if you have multiple systems. One thing you might have to worry about is the security of your signal. If there are other Nyrius receivers within the vicinity of your production, then they could very well receive your signal. That’s one of the things that makes the Teradek and Paralinx systems the preferred wireless gear for closed sets. Nobody has to worry about a camera signal getting into the wrong hands. The Nyrius Aries Pro accepts a resolution of up to 1080p, up to 100 feet with line of sight. That pales in comparison to professional systems that can do 4k up and distances of 1000 feet or more. But for many productions, 100 feet is enough for basic monitoring. Where the Aries really starts to lag is with walls and other objects blocking the transmission. If you take the transmitter to a different room, you may find it loses the signal. 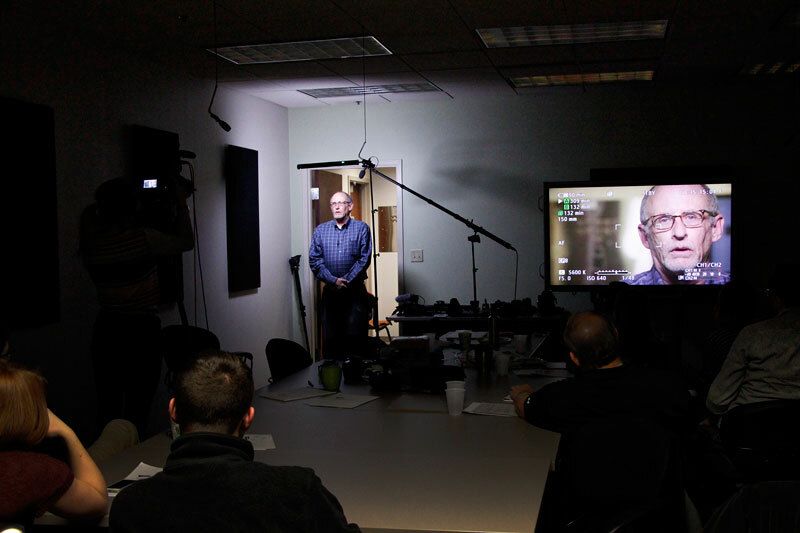 Again, this is not meant to replace professional wireless monitoring systems, but in our cases our director’s monitor is almost always in the same room as the camera, or in a room right outside the interview with an open door. If you’re shooting an interview or an event and you want the receiver to be in a different room with objects in the way, your results may vary. And when there’s a loss of signal, the entire transmission cuts out, rather than stutters or drops frames. A new addition to the Nyrius line of wireless HDMI transmission products is the Nyrius Orion. We received a demo of this unit and found the build quality, ease of use, and affordability quite nice. 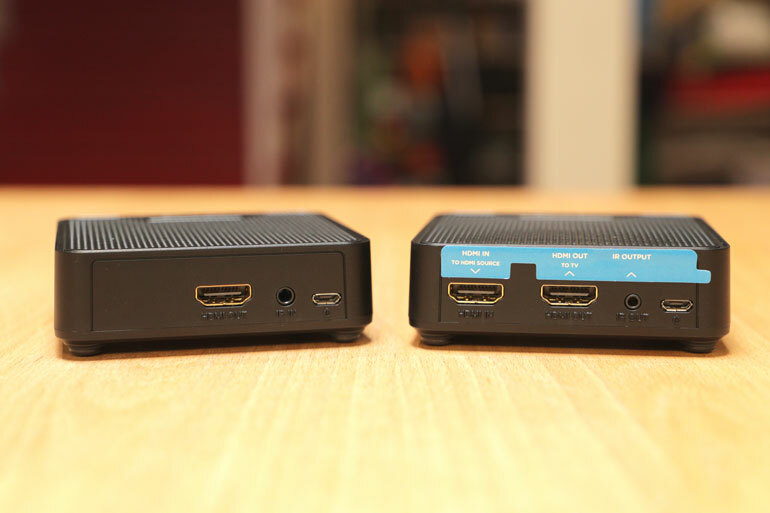 What the Orion is designed to do is take one HDMI signal, send it to one TV or monitor, and then pass through the signal to another TV or monitor without lag. This is a great solution if you find yourself at an event where you need to display one camera or a computer's video stream onto multiple TVs or projectors around the room. Of course the Orion is really meant for a home entertainment system, rather than a production environment, and it works well for that use case. You can mirror one TV’s display on multiple other TVs. The Orion comes with one transmitter and receiver, but you can purchase additional receivers if you want to create a daisy chain scenario. For businesses or event spaces where you want to have one video source streaming to multiple TV screens, the Orion is a great solution. The transmitter/receiver transmission range is up to 40 feet. 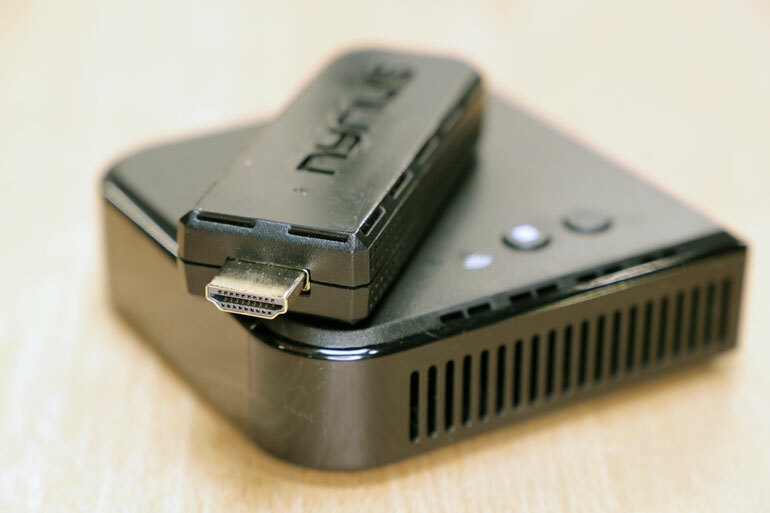 Nyrius bills the Orion as a cable free solution for HDMI wireless transmission, which is somewhat true, but you still need to power and connect your sources. To go from one video source wirelessly to two TV signals, you need to use two HDMI cables, two of the micro USB power cables, plus power extensions if the cables are too short. 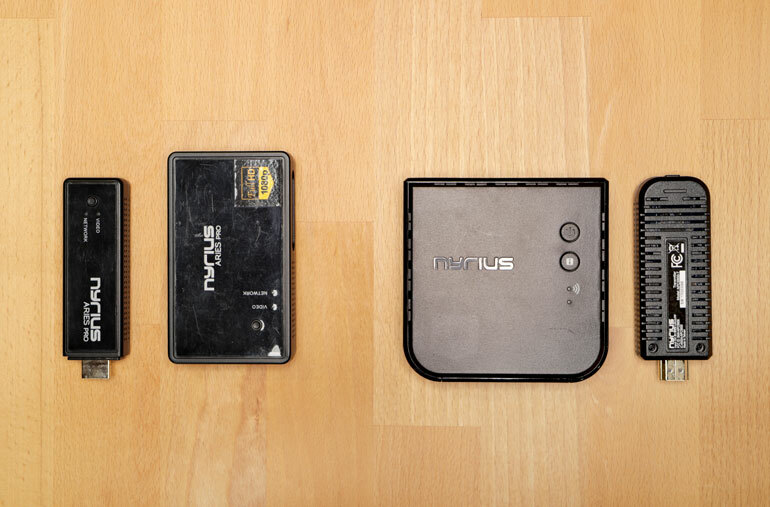 If you want to send the initial feed wirelessly with the Nyrius Pro, you also need the additional kit and another two plug-in or USB power sources to power the first wireless transmitter and receiver. And whether it works with your camera system is not certain. We tried it with the Canon C100, and the Orion was unable to accept the feed for some reason. We’ll have to do more tests with other cameras to see what the issue was, but we ran out of time with our initial testing to determine what the issue was. There are many scenarios in the consumer and professional production world where you don’t necessarily need the very best and most expensive system to provide a wireless transmission of HDMI video and audio. For small corporate productions, or low budget narrative films, a wireless feed is a nice thing to have but maybe isn’t worth thousands of dollars up front. The Nyrius Aries Pro and Nyrius Orion wireless transmission systems are a great alternative to spending a lot of money on pro-grade monitoring equipment. For our productions and media trainings, Nyrius has been a dependable and low-cost solution to simple wireless monitoring. Alternatively, if you just need to get a camera signal to a director’s monitor sitting only a few feet away, a long HDMI cable can also be sufficient. This one is 33 feet long and still thin and flexible. We’ve used a 16 foot HDMI cable for a few years and it’s been a simple solution for static cameras that didn’t need to move around a lot. Questions / Comments? ﻿Get in touch with us.